Dongle, dingle, dingus, doobry, wotsit, thingo, bizzo. What does one call a DAC and head amp snapped into a thumb-sized shell? Since its launch in 2012, Audioquest have seen their competition bring on all manner of similarly fashioned USB DACs to compete against its ground-breaking $249 Dragonfly. Some direct connect like a USB thumb drive: the Audioquest itself and M2Tech’s $295 Hiface DAC. Others require short USB cabling like Meridian’s $299 Explorer or HRT’s $189 microStreamer under consideration today. Newer kids on this busy block are the $350 Canadian Resonessence Labs Herus and the soon-be-released $189 Audioengine D3. Those two debuted at 2013’s RMAF. As you appreciate, a review without comparative data points never cuts it. 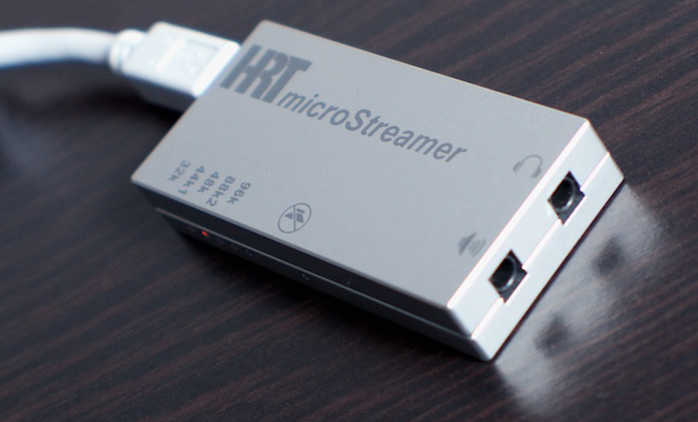 The HRT microStreamer is as arrestingly light as it is small, measuring all of 2.5" x 1.2" x 0.4". It slips neatly into a front pocket and isn’t easily damaged when freed to cut loose in a backpack. USB connectivity is asynchronous via a mini USB B socket. An HRT-supplied cable ships with the unit. 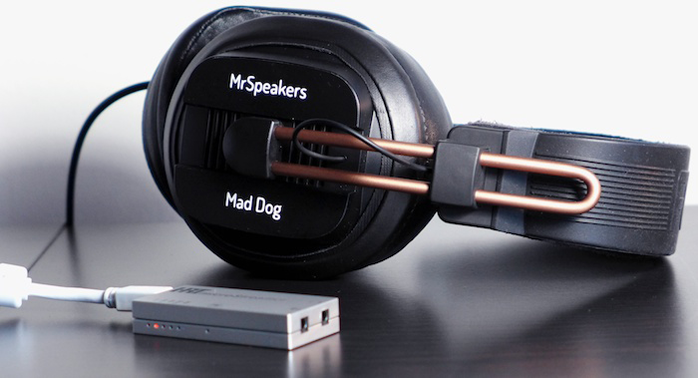 The microStreamer only meets the Class 1 USB Audio spec, hence no drivers required for Windows, OSX or Linux. That has the PCM decoding ceiling set firm at 24bit/96kHz. Playback sample rates are indicated via soft-glow LEDs that run along the side of the chassis at whose bottom sits a ‘mute’ indicator. Output comes from 2 x 1/8" sockets: 2.25V/50Ω line level for DAC-only deployment, variable 1.4V/0.5Ω for headphone feed. Volume attenuation is not—I repeat not!—exacted in the digital domain. The host computer’s software volume control sends value markers to the microStreamer where those markers get mapped to 63 internal analogue steps. Clever, huh? The Audioquest Dragonfly handles volume attenuation in similar fashion. For the first round of evaluations, the HRT microStreamer connected via USB to a MacBook Air running Audirvana+. Being more ectomorphic of acoustic mass, the Zippo-esque HRT proved strong on detail specificity and layering. There’s cleanliness and purity—think bubbling brook—and long-fingered finesse with micro detail reminiscent of the Metrum Octave’s fundamentals. Talking of comparisons, at CA$350 the Resonessence Labs Herus will run you almost twice the price of the microStreamer. It too offers asynchronous USB but goes higher with PCM sample rates (176.4kHz, 192kHz and 352.8kHz) as well as handles the all-trending DSD. On paper it looks like the pricier Herus would trounce the little HRT. Practice shows that ain’t necessarily so, bro. Moreover the HRT’s adroitness with textural subtleties and micro-dynamic flutters makes it better suited than the Herus to the already thick-sounding V-Moda Crossfade M100 as my pick in the $300 portable headphone space. 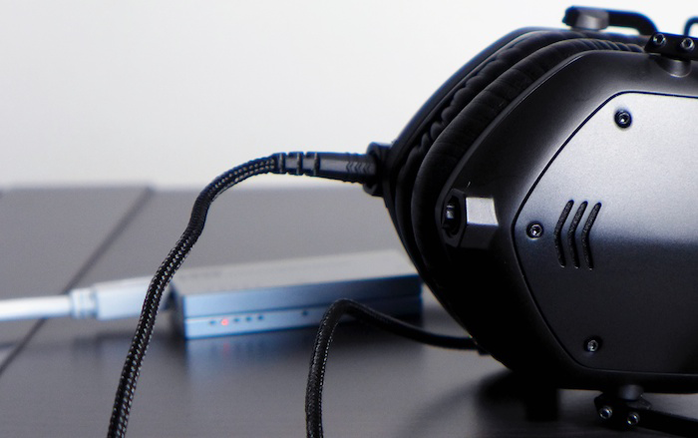 On the other hand the HRT isn’t as good a match as the Herus is when paired with AKG's K-702. The wetter Herus presentation better counterbalances the Austrian’s upper-frequency desiccation. Bottom line, the HRT’s crispness isn’t what you’d call etched or nervy but its caffeination is possibly best suited to warmer darker ‘phones or those that are more polite and/or shake their thing with a less exuberant lower treble. I’ve already penned an appreciation of the microStreamer partnered with KEF’s gentlemanly M500 headphones over at Digital Audio Review.